EXCLUSIVE CHRISTMAS CARD COUPON Code for Tiny Prints! The Challenge: Does sending out Christmas Cards through Tiny Prints really save time, energy and money versus picking up a box of cards at the grocery store or just sending a "Merry Christmas" text or post on Facebook? And more importantly, are personalized, paper cards really still worth it? Methods: We send out customized Christmas cards every year. Don't get me wrong, I’m NOT one of those uber-organized people whose cards include a written story of accomplishments for the year...But I do like the cards we send to feature a picture of our family, a Bible verse, and six individual close ups of the kids, so at the very least, friends and family can see how they’ve grown. I was surprised to see how many of our friends and relatives keep our card displayed throughout the year, either on their mantle or refrigerator. People actually look forward to these now? More than just a little pressure...but this year, I knew it would be easier than ever to get the cards out - that is, assuming I could just get my family all clean at the same time and posed for the picture. Which kid needed a haircut? Who needed their hair styled? Would our teenage son (who is now over 6 feet tall) even fit into the outfit I had in mind? And frankly, just getting my husband to dress up without grumbling seemed like the most I'd be able to tackle this year. (In fact, I actually asked my friends to pray for us.) It was a relief, thanks to Tiny Prints, that I wouldn't have to worry about: hand-writing over 150 envelopes, stuffing them, sealing them, getting them stamped & mailed out in time for Christmas. Because let's face it, I just didn’t have it in me to do all that. And thanks to Tiny Prints, I wouldn’t have to. A bout their Services: There’s an affordable, easy and quick way to send seriously elegant, inspiring and keepsake cards. A good card brings joy, maintains relationships and sure makes you look organized. I’ve always used Tiny Prints because I liked the quality. But last year I tried using them to do the whole thing. And I mean the whole thing. It was as easy as waiting for a good sale, clicking and dragging a digital picture of my family to the card design I liked. I didn’t even need a pen or stamps. I got them done over my lunch break! It was so fast and easy to create a personalized Christmas cards even kinds with various pictures inside and out. The fact that Tiny Prints now has an option to address the envelopes, stamp & mail the cards to everyone in your address book is like a dream! (They even photoshopped out my eyeshadow smudge in our Christmas card picture. They took out the red eye in one of the kids and they evened out the lighting in the kids individual pictures. All for no extra charge. As a matter of fact - dare I admit it? The whole process was actually kind of fun. puts them in the mail from their warehouse, without you even touching them. 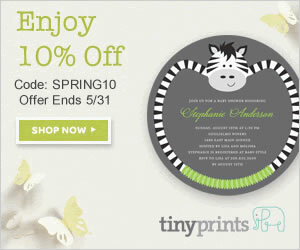 Tiny Prints is running a special discount. Enter coupon code "CB12" when you check out and save 30% plus get free shipping on any order. Saving you Time, Energy & Money. Conclusion: Tiny Prints is a great option to reduce the difficulty, time and expense of sending out cards, announcements or invitations.